When it comes to equipping your home workshop with an assortment of cutting tools, it is best to understand what the different types of saws are and how they can be beneficial to your woodworking jobs. This guide will walk you through a variety of types of saws, so you can make the best decision when it comes to investing in these tools. We’ve organized this guide from the most usable saw to least, in our opinion. That doesn’t make any one saw better than another. We’ve just organized this guide in an order that might make the most logical sense in terms of the order you might utilize these saws, and included lots of pictures. If you’re brand new to stocking your workshop or garage, you might want to start at the beginning. For example, the coping saw and hacksaw are essential tools that will help you in a wide variety of projects around the house. They are easy to use and inexpensive. These reasons are why we have listed them at the top. On the other hand, the scroll saw and table saw are much more advanced power saws, used for sophisticated cuts on larger projects. They are more difficult to use and a lot more expensive. That is why they are listed at the bottom of the guide. ​Again, its worth pointing out – that doesn’t make any one saw better than any other. Each saw has a unique purpose, and excels at a unique type of cut. Saws are most commonly used for cutting hard materials such as wood, PVC, metal, and even plastic. They are a necessity for any DIYer and professional contractor, as they help you accomplish a whole host of projects. Read below to learn all about the most common types of saws and their best use. Also known as panel saws or fish saws, the hand saw has been around for thousands of years. They were evident dating all the way back to Egyptian hieroglyphics, where pictures displayed workers using these saws to cut and craft. Nowadays, every garage usually has a few handsaws lying around. While seemingly old fashioned compared to the newer power saws, there are a few handsaws we still highly recommend keeping around. If you are looking for a saw that will make both internal and external cuts, you may want to opt for a coping saw. Part of the bow saw family, a coping saw has a thin steel blade that is positioned and stretched between a frame with a handle attached at the end. This manual saw has teeth that face downwards, allowing you to cut on the pull stroke. What is a Coping Saw? This handle held saw requires some force when cutting as you manually have to pull it through the material as you cut. Unique to the coping saw is its ability to cut from the middle of a wood piece by removing the blade and stringing it through a hole or cutout. The blade can then be reattached for use, allowing you to cut very intricate piecework without issue. What is a Coping Saw Used For? A coping saw is a very versatile saw to have in your workshop as it can cut wood molding as well as aluminum pipework with ease. A coping saw is typically used when you are trying to achieve coped joints or when you are working with fretwork. While a coping saw does not do well with thin materials, it can, however, cut circular shapes easily. It is a nimble saw that uses a coarse blade for cutting. Using a coping saw does not require a ton of experience. With a little trial and error, you’ll easily understand how this saw operates and be able to manipulate it to cut as needed. You’ll increase your skill level with each operation of the saw and improve your overall cutting results quickly. Fortunately, the cost of adding a coping saw to your toolkit is nominal. These saws range in price from as little as $5 to well over $100, depending on the sophistication and ruggedness you are looking for. When you're looking at types of saws for woodworking, this is an essential. Its a relatively cheap option that you can add to your workshop that can make your woodworking projects easier. If you have a need for specifically cutting metal, you may want to consider a hacksaw as your main cutting tool. This is a handheld saw that will require you to manually pull or push the saw through the material you are cutting using some force. A hacksaw has a fine-toothed blade that can be positioned with the teeth upward or downward, allowing you to decide to cut on the push or pull motion. These saws have a C-shaped frame that holds the blade in place while the material you are cutting is positioned in a vise. The blade of the hacksaw typically measures from 10 to 12 inches, depending on the model, and can even be as small as 6 inches in some cases. What is a Hacksaw Used For? Hacksaws are primarily used to cut metal, but they also can cut plastic. A hacksaw can also cut wood to come degree. A hacksaw is an ideal cutting tool for a plumber or electrician as it can make easy work out of cutting pipes or plastic conduit with dominates these professions. Using a hacksaw does come with a small learning curve. A novice could easily get the hang of using a hacksaw if they have a little patience. Care does need to be taken when using a hacksaw as you can break the blade if too much force is placed upon it. But, a beginner will feel comfortable using the saw with minimal instruction or experience. The cost of a hacksaw really varies by the need of the user. You’ll find hacksaws for under $10 and ranging all the way up to several hundred dollars. The difference in the costs is based on the durability of the frame and blade and what type of material you plan to cut with the device. These types of saws are a good option for projects that do not involve wood but need a powerful saw that can cut with control and some degree of precision. While the coping saw and hacksaw are essential additions to every toolshed (in our opinion), the following is a list and overview of other hand saws. These are typically best used for specific circumstances and cuts, and don't have the broad range of uses that our essential list. That doesn't make them any less valuable for what they are designed to do, just not as robust and wide ranging. The crosscut saw is specially designed to make cross cuts in rougher wood. The teeth are much larger than most traditional hand saws and the blade is really thick. You might picture a typical crosscut saw as the ones seen in movie scenes with two men, one on each side, using a large on to cut trees down. This is the largest and most stereotypical application of the cross cut saw. This saw is also sometimes referred to as the bucking saw or felling saw for how it handles larger timber. Generally, though, the one man crosscut saw is used to cut lumber and timber. Because of its large teeth, it works great as a general saw for outdoors. This is a very standard saw and sometimes gets referred to generally as a "hand saw." Obviously this is an entire class of saws, but the rip cut saw is as generic as they get, so sometimes it gets labeled as such. The rip cut saw tapers down to a virtual point at the very end (away from the handle) to help it move its way through wood. It has fewer teeth than most other hand saws, which allows it to make more precise cuts. For obvious reasons, this saw makes a completely different type of cut than the crosscut saw. The rip cut saw manually cuts wood in the direction of the grain. The teeth also angle back at 8 degrees, compared to the 15 degrees that a crosscut saw has. This means that a rip cut saw will make much rougher cuts than a similar crosscut saw. You'll use a rip cut saw inside mainly for framing or general interior work. As you can imagine, this is the perfect saw to use outside to trim plants and tree branches. It has a rather odd shape: it has a relatively small handle that you grip more like a baseball bat than a traditional saw. The blade, usually at least 12" or longer, arcs out of the handle. The blade has very large, wide teeth, and its meant to cut through rough branches. You can use this versatile saw as a pole pruner, handheld pruning saw, pruning straight blade saw, or pruning curved blade saw​. Also considered a cross cut saw, this saw looks very similar to a hacksaw. Most use this ​on smaller items to make cross cuts, such as thin branches or indoors on small surfaces. Other names for the bow saw are the Swede saw, Finn saw, and buck saw. A bow saw has tiny teeth located very close together. This saw, or versions of it, have been around for quite a long time, dating as far back as the Hellenistic period of history. The fret saw is a lot like the coping saw. Similar to how the scroll saw is to the jigsaw, the fret saw performs more intricate, delicate work compared to it's cousin. The saw looks very similar to the coping saw and you use it the same way. It has a large blade and molding to allow you to get deep into your cut without having to adjust the saw. This is basically the hand version of the scroll saw. Just like the versatility that comes with different scroll saw blades, you can find different fret saw blades to cut everything from wood to plastic to metal. This saw and its blade is very fragile and easy to break. The Japanese saw works very differently in comparison to the typical Western saws that you probably use. The teeth are set in the saw in the opposite direction than traditional saws, and ​cutting is performed by pulling the saw towards the user. In other words, you cut on the upstroke instead of the backstroke. The reason for this is that, due to the way the cut is made, you have a very fine kerf, or cut width. There are three different types of Japanese saws: the dozuki, ryoba, and kataba. These saws take practice to use effectively. However, many say that a Japanese saw is much more efficient in its cutting than more traditional saws. This is a very, very specialized saw designed to cut veneer (obviously). It has a short, squat, double-sided blade. You use it to cut veneer work, which requires precision and a specialized tool. The blade is usually 3-5 inches long. The handle is offset, which allows for you to make cuts that are flush with the surface. The most common application of the back saw that you might envision is in use with a miter box when cutting baseboard or crown molding. As such, they are often interchangeably called miter saws and tenon saws. This saw features a thin, short blade with reinforcement along its upper edge. It works really well for quick, back-and-forth cutting, just like you do when using a miter box for baseboards. In many ways, this saw has the same overall shape and design as the pruning saw. It lacks the curved blade that the prune saw features and instead has a long, straight blade. This saw is perfect when you're trying to cut circles, squares, and other patterns in material such as drywall and plywood. This feature is similar to a jigsaw, but you would opt for a keyhole saw when the area is too tight or small or delicate to use a power tool in. Similar in look and purpose to the keyhole saw, the wallboard saw has a long blade and handle that stick out straight. At the end, however, the wallboard saw has a short wide blade that can be used to puncture surfaces like drywall. A wallboard saw is perfect for puncturing and starting cuts on rough construction surfaces, and is certainly a very unique type of saw. Moving into the world of power saws, we'll start with the portable variety. If you're new to purchasing a saw, these are the different types of saws you'll want to look at. Highly convenient and generally inexpensive, portable power saws can serve you really well. A portable power saw is one that can be used by hand, without requiring set up or stability. Some of the most common and easy to use power saws are in this category, and chances are you'll see the benefits in having a few of these in your garage. A jigsaw is a powerful handheld power saw that can cut a range of materials using up to 45-degree angles. These saws are ideal for cutting details out and getting into harder to reach areas with a saw blade that extends without support from the end of the saw’s handle. Jigsaws incorporate an electric motor which powers a reciprocating blade. This blade has a thin structure and can be made up of varying teeth per inch. Blade thickness determines which types of material that can be cut by a jigsaw. These blades are held into the body of the jigsaw with either a screw or a slotted enclosure. This provides some stability, but it is really up to you to control the usage of the saw. What is a Jigsaw Used For? Jigsaws have a wide variety of uses. When equipped with a thin blade they are perfect for making delicate cuts that require fine curves. Thicker blades can cut through harder materials such as concrete, carpet, countertops, ceramic tile and metal. It is also ideal for wood in any desired thickness with the right blade attached. Jigsaws do require some experience and skill especially if you are looking to make fine detailed cuts. These saws rely on the steadiness of your hand to control the blade and movement of the saw through the material you are cutting. With that being said, a jigsaw is very easy to use, and very easy to practice with. Pick up some scrap wood, and you can practice on developing a stead hand. You also want to practice making curved cuts. The cost of a jigsaw varies as much as the materials it can be used to cut. You can find an entry level jigsaw for around $30 while high-grade versions will run you over $1000. We've reviewed all of your options in our best jigsaw review article. One distinction to make is whether you want a regularly powered or cordless jigsaw. The cordless option adds convenience but might sacrifice a little power, depending on the model you go with. The model that you select should be able to power through the material you plan to cut with ease and provide you plenty of longevity. Jigsaws are just some of the different kinds of saws that come in a variety of power options and blade types. If you have a need to make angled cuts, then a miter saw may be right for you. These types of saws have a circular blade that is pulled down upon the material you are cutting, making them a stable and safe cutting device for your workshop. What is a Miter Saw? Miter saws use a circular blade, which interestingly can be swapped with a table saw for added flexibility. The circular blade typically comes in a 10" or 12" blade size and is made from carbon steel for durability. A coating is added to the blade to allow for easier cutting, and it comes with a variety of teeth options. Unique to a miter saw is its ability to dial in your cut angle. This makes precise cuts for mitered joints that need to fit together at a certain angle. You can simply dial your miter saw to the degree of cut and pull the blade down into the material’s surface to cut through it. While a miter saw uses a circular blade, it is a lot different than a circular saw or c​hop saw. What is a Miter Saw Used For? Miter saws are ideally used to cut molding or trim to fit together at a corner. It can also be used to cut metal with an abrasive blade as well as plastic and other materials that need precise angled cuts. A miter saw, however, cannot rip wood or make long straight cuts. These cuts are better suited for a table saw instead of a miter saw. It is most commonly used to make shorter cuts at precise angles of 15, 22.5, 30, and 45 degrees. There is some skill level that is needed when using a miter saw. These different types of saws require some attention to detail as the degree of angle needs to be dialed in. You ​also should use some caution when using a miter saw as they have a spinning blade that could penetrate the skin, if not careful. You can get your hands on an entry model for under $50 while some industrial models run upwards of $5000. We have a comprehensive miter saw review to help you better understand which is better for your specific use case. The investment you make in your miter saw should be determined by the frequency of use of the saw and what type of material you plan to cut with it. If you have some big cutting needs, a chainsaw can make easy work of cutting large wood pieces such as trees. This is one of the different kinds of saws that is powered and handheld. A chainsaw is a mechanical saw that incorporates teeth along a chain that rotates as you cut. This allows it to slice through wood with great force. ​These saws typically incorporate a gasoline engine which powers the chain used for cutting. Some models are driven by an electric motor, but an engine option offers more power. A clutch is used within the chainsaw to select the position of the chain as well as protect the operator from kickbacks and the engine from overheating in a stalled piece of wood. The guide bar of the saw is made from steel alloy and is approximately 40cm - 90 cm, depending on the model. This provides the cut length of your saw and guides the chain as you cut. What is a Chainsaw Used For? The applications for chainsaws really runs the gamut. They are ideally suited for tree work such as cutting limbs, pruning, felling, bucking, and preparing firewood. You may also see chainsaws used to cut concrete with a specialized blade as well as to delicate ice sculpture work. 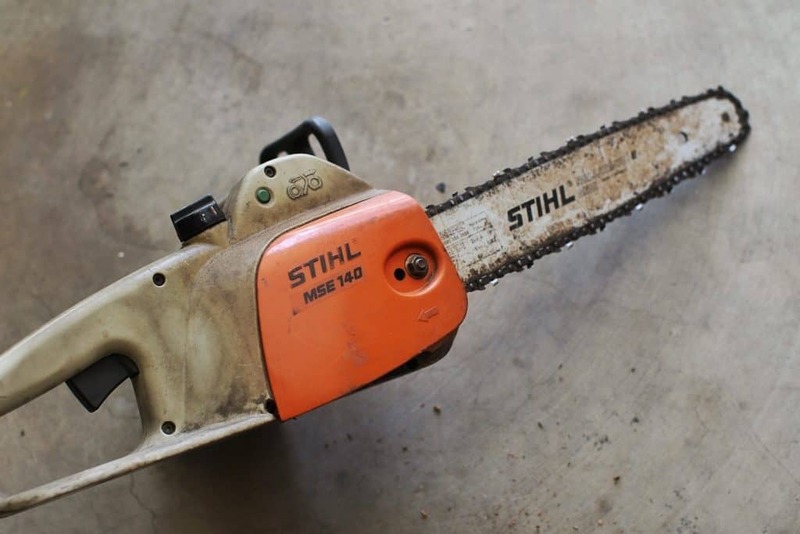 In most instances, chainsaws typically do not cut with a high degree of accuracy and are mostly used to slice wood into more manageable pieces such as firewood. With that being said, here is a really fun video from the European Chainsaw Speed Carving Championships - check out their amazing carvings with a chainsaw! A chainsaw takes a great degree of experience as they are dangerous saws that can easily take a limb off if not careful. Chainsaws use a great deal of power to cut through wood and require control as you cut. A beginner may find that a chainsaw is unmanageable and uncontrollable to work with at first. They would definitely need some instruction and guidance when using a chainsaw for the first time as well as information on the correct safety precautions to take. Depending on the power and cutting ability you are looking for, your chainsaw could range in price from $50 to $2000. The higher horsepower engine you select will dictate the price of your chainsaw, but it will provide plenty of power as you cut. The frequency of use also commands the price tag on your chainsaw. If you have a particularly hard surface that needs to be cut, you’ll want to select a chop saw for your project. These saws can be configured as walk behind or handheld models. They are engine-driven or electrically-powered depending on the size and application they are used for. What is a Chop Saw? A chop saw is a heavy-duty saw that allows you to cut into a hard surface using an abrasive blade that is similar to a grinding wheel. These saws use blades that are 14" - 16" in diameter, depending on the size of the saw. They require you to manually move the saw through the material you are cutting and guide each step of the way. What is a Chop Saw Used For? Chop saws have an extensive range of materials they can cut through. They can cut concrete, rebar, steel pipe, tile, or asphalt. They are typically used to make joint cuts or to cut through an extremely hard surface with ease. A chop saw does need some guidance when using this powerful saw to cut. The weight combined with the cutting force may be surprising to a novice during operation. To ensure safety and accuracy as you cut, it is best to have instruction on using the saw first. The price of a chop saw varies by the durability of the machine as well as the application it will be used for. You’ll pay more for an engine-driven model than an electric option. Walk behind models are also more expensive ranging several thousand dollars. For projects that require a more hands-on approach, you may want to try a circular saw. These are different kinds of saws that are used in building projects. It is a relatively lightweight handheld saw that you manually push through a material surface. What is a Circular Saw? A circular saw uses a round blade that rotates as you cut. It is the cousin of the table saw and offers you plenty of accessibility on the job site as you are able to take it wherever you need to cut. To use a handsaw like this, you need to guide the saw through a surface while holding the material firmly as you cut. During cutting, a circular saw uses its blade to chip away wood slowly to make a cut on a surface. As the blade spins, it uses its teeth to chip away the wood to prevent any sticking or binding to the blade. These saws are electrically powered and are easy to maneuver as you cut. What is a Circular Saw Used For? You’ll see circular saws used in a range of homebuilding applications. They are a good carpenter tool and can be used to make rip cuts or crosscuts. These saws can cut wood, metal, plastic or masonry, although they are most often used as a popular type of wood saw. While a beginner will learn quickly the nuances of using a circular saw, extreme caution needs to be taken when using this cutting tool. Since the blade is exposed, it can pose a potential danger to a novice woodworker that doesn’t have the experience with the saw. Cost of a circular saw starts under $100 and can run to $2000 or more, depending on the sophistication required. These saws are a nice tool to have in your workshop as they allow you to cut with accuracy to the dimensions you need. These are the serious saws. While you probably don't need them when you're just starting, a stationary power saw will allow you to make precise and accurate cuts across a multitude of surfaces. Not only do you gain accuracy, but you also gain speed. These power saws are big and stable, and highly focused on allowing you to make many, many cuts over and over. If you have big projects, you'll want one of the many stationary power saws on our list. When you are looking for a nimble saw that can cut through a variety of material types using an interchangeable blade, then a bandsaw is the perfect saw for you. This saw has a long blade that you feed material into manually. The bandsaw can cut with accuracy and allows for curved as well as straight cuts. A bandsaw is an electrically driven saw that you can use to cut a myriad of jigsaw shapes. It uses a long blade that can be equipped with a varying degree of teeth. Blade length is determined by your machine size and the material you plan to cut. Two wheels are used to move the blade of the bandsaw, giving it its power and versatility. What is a Bandsaw Used For? A bandsaw is one of the different types of saws that you can use to cut virtually anything if you have the right blade attached. It can be used to cut wood, metal, and plastic. It is mostly used in woodworking or lumbering applications as well as metalworking jobs. The best use for the band saw is cutting through really thick wood, like logs. A lot of people confuse a bandsaw with a jigsaw or a table saw, but their use and application are dramatically different. A bandsaw will take some getting used to as you are in control of how and where it cuts on a surface. To use a bandsaw, you feed your material into the saw manually, so it does take some skill to manage accuracy as you cut. The investment ​in a good bandsaw will run you approximately $150 for an entry model while very advance units can cost upwards of $25,000 for industrial and commercial applications. A lot of your costs are based on what size bandsaw you want. You’ll find that a bandsaw gives you a lot of flexibility as you cut and is one of the different types of saws available that has wide-ranging applications. A reciprocating saw is a handheld powered saw that uses a reciprocating blade to cut through a variety of materials. It provides a determined cut that doesn’t allow for great accuracy but is ideal for when you need to cut through a surface quickly. What is a Reciprocating Saw? When you need to cut through a surface without any degree of accuracy, a reciprocating is an ideal cutting tool to do the job quickly. It has a handle that helps you maneuver the saw and a cutting blade with a curved tip that digs into a surface with great force and power. Reciprocating saws use push and pull force to cut and requires you to control its operation as you cut. It uses a variable speed drive and comes in corded and cordless models. What is a Reciprocating Saw Used For? You can use a reciprocating saw for a variety of applications. It is mostly used in emergency rescue operations and construction projects where it is often used in demolition projects. It can also be used in tree trimming applications and window fitting projects. With a little care, a beginner will find that a reciprocating saw is quite easy to master. Since it doesn’t require any accuracy when cutting, you can easily use it to teardown or cut into a surface with a little effort. Safety should be taken when using a reciprocating saw as the blade is exposed and could cause injury. The cost of a reciprocating saw is quite affordable. You can easily find a model for well under $100, making it a good saw to invest into for your home projects. ​A scroll saw is a flexible saw that allows you to cut intricate detail and design work. It can be pedal-driven or electrically operated, allowing you cut wood in a variety of dimensions. A scroll saw is one of the different kinds of saws that you can use to for fine woodworking projects. It features a reciprocating blade that gives you the option to remove it and place it within a cutout hole to saw inside shapes and perform detail work. A scroll saw comes in a range of throat sizes from 12" - 30", allowing you to customize the machine to the type of cutting you need to complete. The blade of the scroll saw is typically 5" long and can be customized to your cutting requirements. Scroll saws are really best thought of as a highly specialized saw. Unlike a jigsaw, which is a wide ranging versatile tool, the scroll saw is best suited for scroll work only. Unlike a bandsaw, which is best suited for big heavy cuts, the scroll saw is made for tight turns while cutting. What is a Scroll Saw Used For? In most instances, a scroll saw is used to cut very intricate wood pieces. It is a compact saw that allows a lot of creativity when completing a woodworking project. The blade moves slower on a scroll saw, offering you more control and containment. These types of saws can cut curves as well as make straight cuts in wood. You'll want to make sure you're using the right wood for scroll work, as this saw is a bit finicky in what it can cut through. You do need some experience when working with a scroll saw to really take advantage of its capabilities. You do need to heed some caution when using the saw as fingers can easily get cut if you are not careful. Get started with a scroll saw by taking a look at our free scroll saw patterns. The cost of a highly rated scroll saw varies greatly. You can find a decent model for under $100 while more advanced models range upwards of $2000. Determining your degree of need for a scroll saw can help you determine a model that will work for you. A table saw is a tabletop cutting tool that allows you to rest your wood piece on its tabletop surface and push it through the blade of the saw. It is one of the different kinds of saws that you will get plenty of use out of as it has a myriad of applications for ripping and straight cutting wood. What is a Table Saw? A table saw is a flat saw that has a cutting blade that extends upward from the center of the saw. You need to push material through the blade and guide it as you work. These types of saws allow you to cut wood down to size without having to worry about exact dimensions or accurate cuts. A table saw is much larger and more robust when compared up against another saw like a bandsaw. A table saw is also a lot different than its cousin, the track saw. It uses an electric motor to drive the blade which should only be extended upward as much as is need to cut through the wood for safety. You need to move your wood piece through the table saw as it cuts. There are several types of table saws, ranging from portable options for a job site, all the way up to large cabinet table saws. What is a Table Saw Used For? A table saw is ideal for ripping wood or making long, straight cuts in large diameter wood such as plywood or MDF. It can be used to cut metal, glass, and plastic with the right blade. Using a table saw fence, you guide the wood through a large circular blade to make your cuts. Unlike a circular saw, a table saw is highly accurate. You can cut fractions of an inch off of a piece of wood. You do need to have some training before you begin using a table saw. Because this saw is so dependent on how you maneuver the wood through its blade, you can easily cut off center. It is also important that you take the necessary safety precautions when using a table saw as you could easily cut your fingers if you are not careful. The saw can also kick the wood back into you if you use it incorrectly. You should have an experienced person show you the basic safety requirements of a table saw. Table saws come in a range of price with affordable models costing a few hundred dollars. You can also find table saws that are over $8000 if you have an industrial need for additional power and durability. We've provided table saw reviews so that you can select the best one for your needs. Don't forget to look into the best portable table saw if you're someone who works on a job site frequently. Another one of the different kinds of saws that you can choose to invest in is a tile saw. This saw is specifically designed to cut ceramic or porcelain tile. It uses water as a cooling agent while the blade cuts through the hard tile surface. What is a Tile Saw? A tile saw is a powered or manual saw that uses a blade to make exact cuts in tile to allow it to fit within a specific dimension. Because tile is a particularly hard surface, water is used to keep the blade from scorching the tile or leaving burn marks. Water runs over the blade as you cut. For porcelain tile, a diamond blade is used to cut through the particularly hard surface. You can make straight, and angled cuts with a tile saw. In the manual version, it uses a breaking jib and cutting wheel to score the tile and break it according to the size needed. Powered models use a blade to cut accurately through the tile. What is a Tile Saw Used For? A tile saw is used to cut a variety of tile types. These tiles materials can include some clay, ceramic porcelain and stone tiles that you would use in your home’s bathroom ​for the shower, bathtub and flooring, or your home's kitchen for backsplash wall, or even to tile your stairs. A tile saw can also be configured to cut glass or brick with the right blade. A tile saw takes some experience to get the exact cut dimensions you are looking for. A beginner may have issues with edges not breaking clean or tiles cracking during the cutting process, which can produce waste. It is best if you have someone that has used the tile saw assist you with the process until you are certain you can manage the saw on your own. A tile saw can be purchased for under $100. Models do range upwards of $8000 for industrial applications. Make sure to look into the best tile saw, as many don't cut very accurately. You will be able to find a good working tile saw for a few hundred dollars, making it a good investment if you have tile work to do in your home. These different types of saws can help you complete any type of project you have planned for your home. Choosing the right one for you can make sure your project goes as planned and without issue.